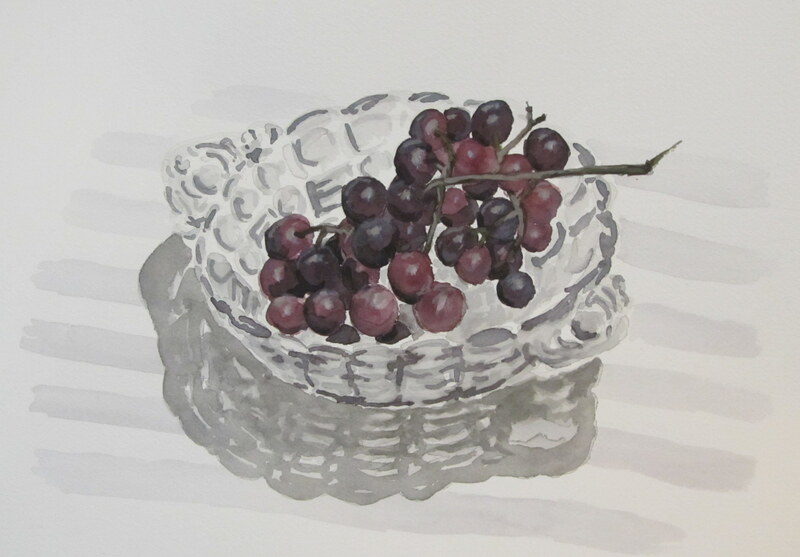 Watercolour Wednesday — Grapes in glass dish. Another late night fruit study. There’s something really fun about late night painting with a dead-line looming. And there’s something really satisfying about being able to pull it off. It’s interesting that at the downtown studio on Sunday I did an acrylic still life—my first acrylic painting in weeks and weeks—and my artist friend commented on how much more loosely I painted in acrylic than in watercolour. I’ve thought a lot about that. I thought that it was odd since I had started doing the watercolour paintings to loosen up and have more fun with it. Is this mission accomplished then? Or have I just swapped out my tedious painting style from the acrylic medium to watercolour? I was going to try doing this one very loosely, and it is pretty loosely done if you see it in person, but I think in the end I always get caught up in trying to make it look just like the real thing. Such a rules-abiding person I am. Ah well, it is what it is. Maybe in another 30 years I’ll see how this all fits together in a cohesive body of work. Until then I’ll flounder. ← Watercolour Wednesday — Living room at night.